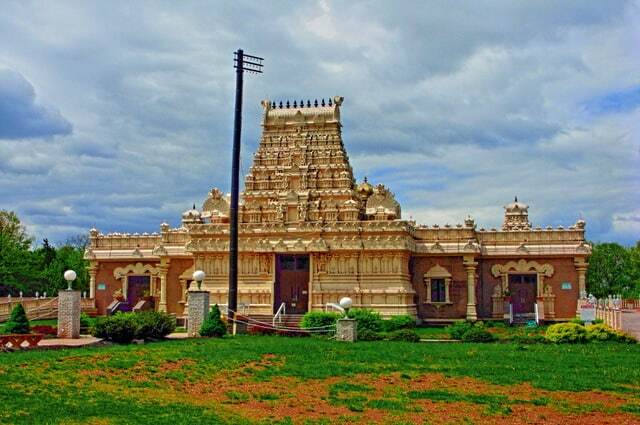 Sri Venkateswara Temple Bridgewater NJ (also known as the Balaji Mandir) .In September, 1989, a group of Telugu-speaking Hindus organized and incorporated the Hindu Temple and Cultural Society. The group started to explore the possibility of building a Hindu temple with the Hindu God Shri Venkateshvara as the main deity. The board discovered a unused church property in Bridgewater that had recently been set for auction in bankruptcy court. On December 9, 1991, HTCS won the bidding and settled on a final price of $950,000. The judge gave them 45 days to raise the full amount. During that time, they raised $450,000, and loans from temple members made up the rest. On January 29, 1992, the property was theirs. After some renovation, they inaugurated the existing building for use in February, and opened it to the public in March. At that time, the temple consisted of a large gathering hall with posters of the various deities used in worship. A full-time priest was hired from the Ganesh Temple in Flushing, Queens, and in November, 1992, the Pancaloha (“five-metal”) murthis (images) arrived from Tirupati, India. These became the official images of the temple. That same year, the HTCS held its first election for seats on a 25-member board, and drew up a constitution and bylaws. In 1994, planning began in earnest for the building of an authentic south Indian temple on the premises. Shri Ganapatisthapati, a famous temple architect from Madras, India, was asked to make plans for the temple, which were presented and approved by the Bridgewater planning board in 1995. Ground-breaking followed in June. HTCS hired the Dimension Stone Construction company and construction started in May of 1996. The construction process of the HTCS was unique in that the builder traveled to India to study and adapt traditional temple architecture. He produced computerized drawings of the main features of the temple and presented them to the HTCS board for approval. After approval, the drawings were sent to Bahrain, where they were converted into pre-cast molds and filled with glass-reinforced concrete. In contrast to the traditional hand-carved process by temple craftsmen, this process produced precise dimensions in a short time. The component parts were then shipped to NJ and assembled by the construction company. The temple was completed in June of 1998. At that time, the Kumbhabhishekam, the main consecration of the temple, took place, with 12,000 people in attendance. Two priests from India, one Chinnageeyarswamiji and one Shri Muthukrishnagurukal, officiated at this ceremony. Several granite images from Madras and marble images from Jaipur were also installed (Shir Venkateshwara, Shri Devi, Bhu Devi, Ganesha, Shiva, Parvati, Murgan from Madras; a Satyanarayana image from Andhra Pradesh; Durga, Laksmi Narayan , Radha Krishna, Ram Parivar, and Hanuman from Jaipur). The final touch was the Kumbhabhishekam of the Rajagopuram, or tower over the main gate, in July of 1999.